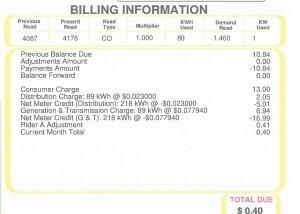 If you live in Ohio and own or are considering installing residential or light commercial PV solar, please contact Governor Kasich at his office and tell him you want him to oppose SENATE BILL 58, currently in discussion. Thank you for writing with regard to Senate Bill 58. Your letter has been forwarded to me for my review. We appreciate that you took the time to share your views about this important piece of legislation. Senate Bill 58 is currently being debated during the 130th session of the Ohio General Assembly. Please be assured Governor Kasich will keep your views in mind if Senate Bill 58 is passed by the General Assembly and forwarded to the Governor for his signature. I encourage you to share your concerns with your legislators, as your input will be important as they review this legislation. Once again, thank you for writing to Governor Kasich. Please do not hesitate to contact the Governor’s office if we may assist you in the future. We must all pull together to RAISE the percentage of the RPS (Renewable Portfolio Standard) upon which the Solar SREC values are tied, if we want to preserve the extra value that this represents to the smaller producers of solar energy!! It’s currently pegged at a max of 1/2%, and should be more like 2% of the total 12% renewable energy long term goal. Just thought I’d post this for the convenience of those folks who might attend my seminars this year, and would like to review them at their leisure from home. Even if you don’t attend the fair, there’s some pretty good info in this presentation for anyone considering doing PV Solar as a DIY project. The rest of my blog is filled with lots of detailed photos and text from solar projects of all sizes and equipment types. This 45 foot hay barn will gain a solar CANOPY extending from the South face just above the rain gutter. 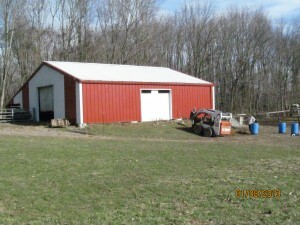 This simple 45 foot hay barn on the East Side of Cincinnati is the location for a 32 panel PV SOLAR CANOPY. With my help, the owner of this 32 horse boarding stable will erect a massive solar canopy that will cover about 80% of his electricity usage. It will include two Sunny Island battery powered inverters for off-grid backup capability. This stable is located at the end of a long country road, and it seems he is always first to lose power and last to have it restored. Watering the horses is important to their health, and the backup system will keep trough heaters and well pumps operating when the weather is at its worst in terms of outdoor temperatures. 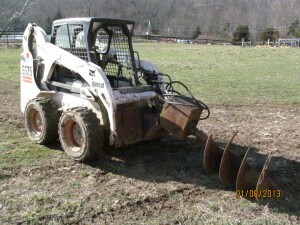 We were very lucky on this installation, since the property owner had a small bobcat and an augerattachment with a 24 inch bit. The array will measure 13 feet tall by 42 feet wide, which is more surface area than the wing of a regional jet! 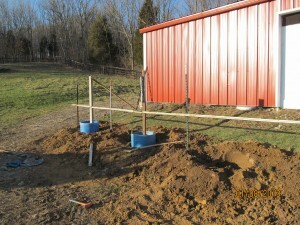 This makes it doubly important to anchor the panel mounting structure to mother earth! The property owner is a bit of a scrounger, and he had a nice supply of 1/4 inch thick X 4 inch angle iron for the front row support legs. This will be capped by an S shaped steel beam across the front and rear row. Standard UNIRAC solarmount 160 inch rails will then carry the panels. Brackets attached to the barn vertical wall beams will carry the rear steel rail. Prevailing winds are directly from the south/southwest so the majority of wind loading will be in a downward direction. The steel angle iron and 24 inch concrete columns exceed the requirements needed to achieve the 90 MPH wind rating for the array. AND, the owner saved a bundle since he had the parts on hand! Why bother to take a picture of a hole in the ground? Depending on the jurisdiction and how it works in your area, you may need an inspection BEFORE your pour, so that hole depths can be validated, to assure safe anchoring of the ground mount array. In this case, the property is zoned AGRICULTURE, and inspections are not needed. 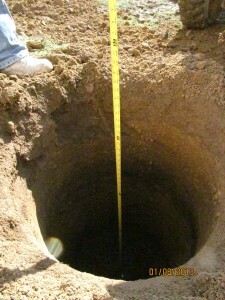 But just to be safe we documented the depth of every hole. Paperwork can be a pain, but documenting your actions can be worth it’s weight in gold if problems crop up down the line somewhere. And, above all, if you are unsure of where you’re digging, CALL BEFORE YOU DIG. If you need them, GET PERMITS as well. They might be a bit of a hassle, but they are there for a reason – mostly to protect YOU from getting in trouble. Your solar array will be productive and last for MORE than 25 years, so take your time and do things RIGHT the first time! So here is where we left the project yesterday. Those blue forms for the concrete area 50 gallon polyethylene barrels that can be had for about 5 bucks apiece. Cut the ends out and they make forms that will last forever. metal posts and cross beams provide some stability for the steel angle beams that will form the front supports for the array. I’ll add more posts as the project moves along. It IS January, and weather can always be an issue, but this DIY SOLAR enthusiast plans on seizing every opportunity to get this array completed an online as soon as possible to start reaping the benefits that PV solar can provide!! I’ve never discussed this, but these devices are cheap insurance (not really, but you get the idea…) against all kinds of problems that can come about as a result of electrical storms. I’ve used the powered type in the past, and have one installed currently, but I came across a totally passive version that uses no power, is self resetting, and if it does fail, it fails OPEN, so it won’t cause problems. Best of all, you can get them for 30 bucks on ebay, brand new, including shipping. Just search for “LA302R”. It has 3 wires, and you simply install it in your electric box to a breaker connected to L1, L2 and Neutral. If you’re not an electrician, hire one to do this. It takes about 2 minutes. It takes longer to get the cover off your breaker box than it does to install one!! Check out this 1 page report regarding current market interest in solar panels. Solar Panel Market Survey It shows the interest falling off slightly for this time of year, but it mentions that China is working to provide buyers with incentives (read that to be even better pricing!!). Just thought I’d share this with my followers. Now is a great time to buy panels. 235 to 245 watt mono and poly panels are selling between .80 and .90/watt in pallet quantities. Pallets usually hold between 24 and 29 panels, depending on supplier and brand of panel. Sellers don’t like to “break” pallets, since they don’t have a good way to store or keep track of loose panels in their warehouses. You can always sell extra panels (at a markup!!) on Craigs list, or partner with a neighbor and split the shipping costs. Shipping (truck freight) can run anywhere from $200 to $450, so don’t be afraid to ask for a BETTER DEAL on freight when you are making a purchase! What it takes to keep your power UP when the grid is DOWN! That pile of parts is worth about $4500 if you’re considering doing this. 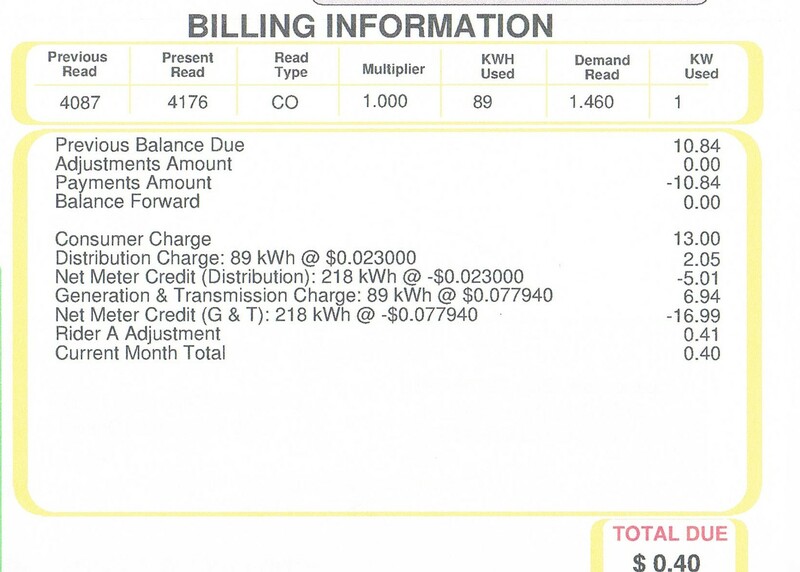 Well worth the price if the grid goes down for ANY reason! I’ll take pictures as I go and do updates to describe my trials and tribulations! DIY Solar is affordable and reliable ( and a great way to prepare for Zombie Armageddon ) just kidding… and have a SUNNY day! POLLEN can reduce your solar output! I’ve not been on the roof to clean my panels since I put them up last July. This past Spring, I had to wash my car twice to get rid of a sticky yellow buildup of pollen, but it didn’t occur to me that this same pollen could be on my panels. Imagine my surprise when I went up there and found the entire surface of all the panels to be COVERED with pollen – it was like 150 grit sandpaper! This most certainly caused the light to diffuse and reduce the amount of solar energy impacting directly on the solar panel glass!! About 15 minutes with a bucket of soapy water and a cleaner/squeegee made them good as new. Solar output increased immediately by about 5% compared the the day before (both days equally sunny with no clouds). Moral of the story: if you want max power, you need clean panels! If you can reach them with a stream of water from a hose, do this regularly to prevent buildup of dirt and pollen!